Purchased for just £800 as a four year old, Kovera won his second race in quick succession yesterday, finishing strongly under a power-packed ride from Alan Johns to just get the better of a three-way tussle up the home straight at Newcastle. The bargain buy is clearly an improving sort and though this win, off the same mark as when successful by 18 lengths at Sedgefield last time, was far harder-thought, there is little doubt he has considerably more potential over fences, having jumped particularly well on his way to victory at Sedgefield just a week ago. The handicapper hasn’t taken severe action over the larger obstacles and that is what Kovera will return to next, the son of Antarctique looking to have an excellent chance of recording his third consecutive success for owners Oceans Racing! 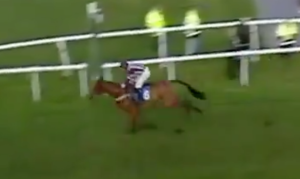 A very well-bred five year old, Cap St Vincent looks a progressive young chaser in the making, getting off the mark at the second time of asking over the larger obstacles at Ludlow yesterday in the manner of a well-handicapped horse. 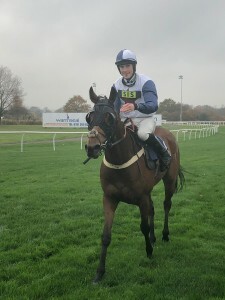 The son of Muhtathir joined us at the beginning of the year after and, having shown some promise over hurdles in the spring, the penny looks like it is beginning to drop with him now, as he travelled very well through the contest yesterday under Alan Johns before taking up the running at the third-last. Though he made a bad mistake there, he quickly regained his momentum, coming clear after the last to score by eight lengths. He looks to have plenty more to offer in this sphere and hopefully he will make a bold bid to follow up this win. Congratulations to his owners Brian and Wayne Jones! 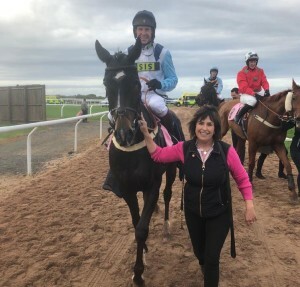 A maiden under rules, Kovera had won a point in April and, having finished runner-up on his previous start over fences at Southwell last month, he duly went one better with an authoritative display at Sedgefield yesterday under Alan Johns. The six year old is bred for the job, being a half-brother to a cross-country winner in France and out of a half-sister to the smart Exit To Wave, and it was very pleasing to see him put in such a polished round of jumping in front which, despite the large winning margin of 18 lengths, was certainly a very big part of his success. Providing the handicapper doesn’t overreact to the margin of victory, he should have an excellent chance next time and hopefully he can continue to progress for his owners Oceans Racing. A £22,000 purchase at the Doncaster August Sale, Tight Call has made the perfect start to life at Pant Wilkin, building on his bumper success at Stratford last month with a taking display on his hurdling debut at Hereford yesterday under Richard Johnson. The four year old was sent into the lead from the off and, jumping fluently throughout, he travelled well before putting the race to bed rounding the home turn. It was an impressive performance from the exciting son of Mahler, who had been working well and looks capable of developing into a useful novice as the season progresses. We’ll look for a similar race next time but, if he can defy a penalty, we’ll then consider stepping him up in grade. Congratulations to his owners Eric Newnham and Jonathan Shinton! A winner at Carlisle on his seasonal reappearance in October, Looksnowtlikebrian had been raised 4lbs for that effort, but in a stronger race he made light of that extra burden with a very impressive success, bounding clear to win in the style of a very progressive young chaser. He travelled particularly well through the race under Richard Johnson before coming clear after the last and, now four from six over fences and with his mark likely to climb to the mid to high 130s, he will get into the Welsh National and that is very much the aim, with the possibility of one run beforehand, perhaps in the Rehearsal Chase at Newcastle at the beginning of December. A winner over hurdles last November, Chozen has always looked a chaser in the making and the six year old ex-Irish pointer got off to the perfect start on his seasonal reappearance, making a winning debut over fences in a 2m handicap chase at Southwell yesterday under Alan Johns. A keen-going sort, we rode him with plenty of restraint last term, but he is maturing now and Alan was keen to make plenty of use of him. 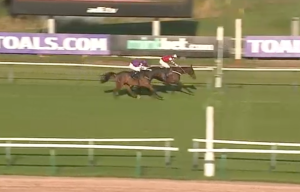 In front from the off, he was headed by the eventual runner-up on the first circuit, but hit the front again three from home and kept on strongly to score, the pair drawing a long way clear of Cap St Vincent, who finished a very pleasing third. Chozen will stay further and soft ground should see him to even better effect, so hopefully there is a good deal to look forward to with him in the coming months. Congratulations to his owners Dave and Jodie Pearn! 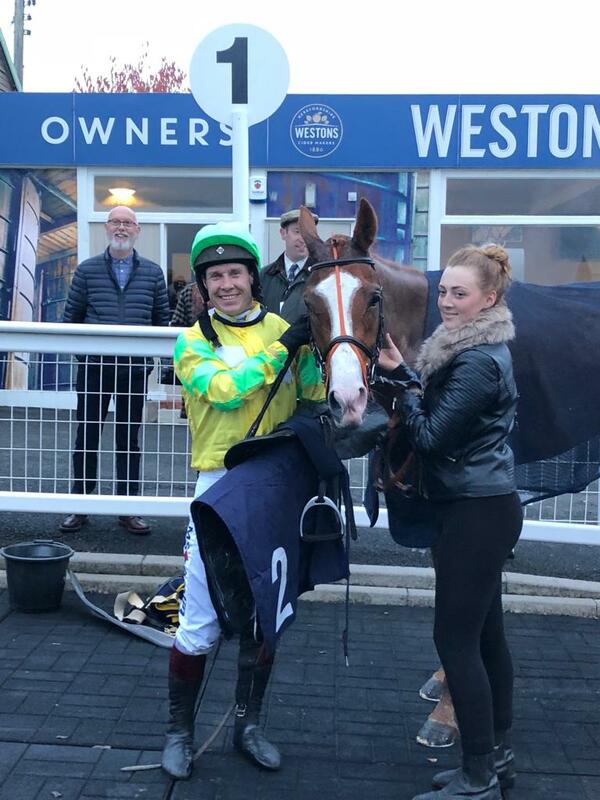 A dual winner over fences last term, Looksnowtlikebrian is a lovely prospect for staying handicap chases this season and he got his campaign off to the perfect start at Carlisle today, responding to a fine ride from Richard Johnson to get up in the dying strides. The son of Brian Boru jumped well in the main and was coming with a strong challenge approaching the last, only to get it all wrong. However, he quickly regained his momentum and, with Dickie in no mood to be denied, he got up close home to win what looked a very competitive handicap chase. It was an excellent performance against seasoned handicappers and one that bodes very well for the season ahead. Looking further ahead, I hope he can develop into a Welsh National horse. 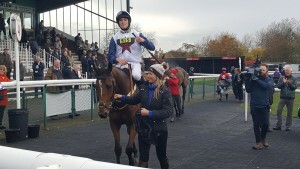 A £22,000 purchase at the GoffsUK August Sale at Doncaster, Tight Call made an instant impact on his debut for the yard, making his second start under rules a winning one with a ready success in a bumper at Stratford yesterday under Richard Johnson. A shade keen through the early stages of the race, he made much of the running and, though headed shortly before the home turn, he rallied gamely to regain the lead a furlong out and galloped on resolutely to the line. The four year old son of Mahler looks a lovely addition to the yard and we may well try to win another bumper with him under a penalty, but whatever happens he looks sure to go on to better things over hurdles. Congratulations to his owner Eric Newnham! 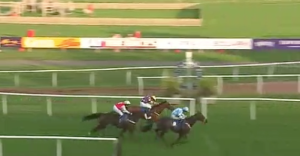 The National Hunt season really kicks into gear this month and, though Chepstow in mid-month traditionally marks the start of the autumn/winter campaign for us, it was lovely to see the reappearing pair Trixster and Canton Prince combine to give us a double at Warwick yesterday, the perfect start to what promises to be a busy month for the yard. Though he hadn’t reached the frame in five starts last term, Trixster did look like winning at Chepstow in January before falling at the last and the son of Beneficial is one that we have been really looking forward to seeing back on the racecourse this term. He showed a gritty attitude to get the better of the favourite after the last and, considering he will be much more at home over three miles on soft ground, I thought it was a very promising performance. We’ll give him his three weeks now and look for something at the beginning of next month. 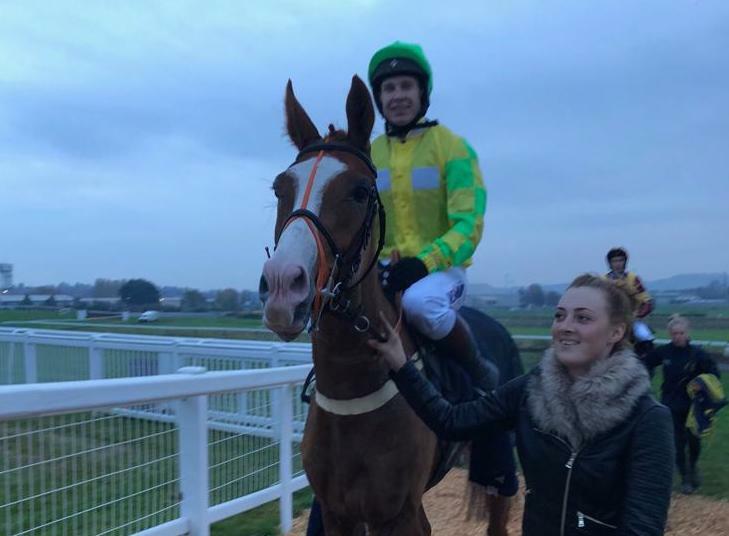 Canton Prince has had more than his fair share of niggles in the past couple of seasons, but the seven year old son of Shantou was a smart novice hurdler and had looked to be coming with a strong challenge in the Persian War back in 2016 prior to making two dreadful mistakes. He has been lightly-raced since, but yesterday’s first outing for 11 months saw him produce a career-best effort that augurs very well for the months ahead, travelling strongly into the lead before three out and staying on well to score comfortably. We will look for a similar race for him next time and, hopefully he can win a nice prize this term. 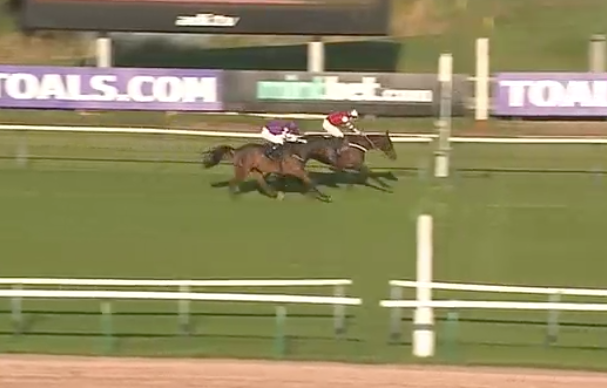 A winner of a restricted point in June, Midnight Queen was in the process of throwing down a strong challenge on her rules return at Southwell last month, only to fall at the third-last. 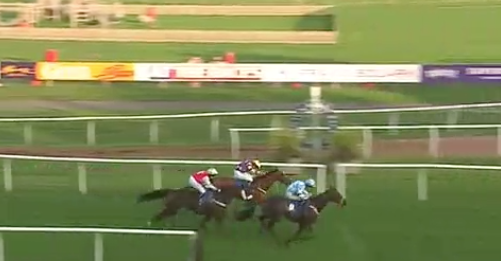 Given plenty of time to get over that, she made her third chasing start a winning one with a game display yesterday, coming from the clouds under a never-say-die ride from Richard Patrick to get up in the final strides, a result that hadn’t looked at all likely when ridden along and last with a circuit to go! Stamina is clearly her forte and she could return to the course for another conditional jockeys’ contest over the same trip on the 10th, as otherwise there is very little for her until mid-October.